This is the second design of the serie “Deruta by GPA” inspired by old maiolica/pottery designs of Deruta art. 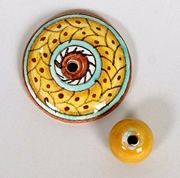 D2 kit: Flat button GG and Small yellow Fuseruola (pottery bead) by “Academy of Deruta Work”. 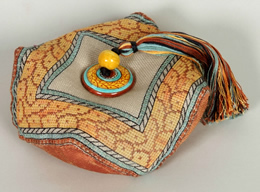 Please inquire with Giulia Punti Antichi for purchasing this kit and also see the section “Deruta Majolica Beads and Buttons – The Fuseruola, an antique Umbrian token of love in majolica from Deruta”. Stitches Cross stitch over two, Back stitch, Smyrna Stitch.